With fierce beliefs and strong opinions, the North American economist, Deirdre McCloskey, provokes fruitful debates on the economy, society, and history wherever she passes. 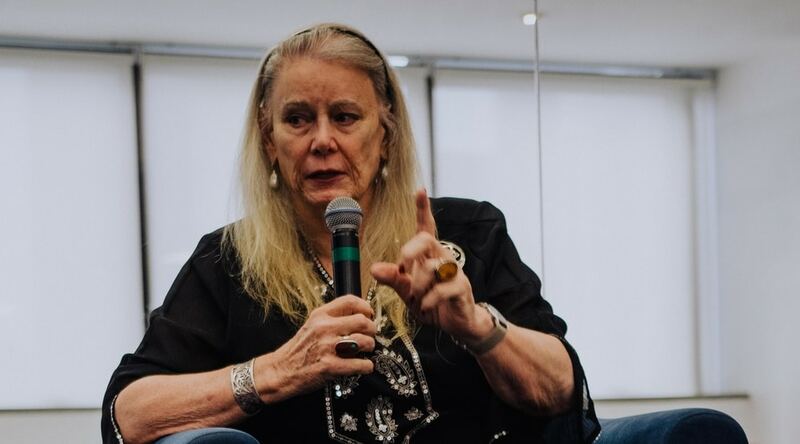 A distinguished professor at the University of Illinois at Chicago and author of seventeen books, including a trilogy on the Bourgeois Era, the economist was in Brazil for a conference last week. LABS had the chance to talk to McCloskey about her opinion on social equality, liberalism, the future of Latin America and how the region can economically reach world potencies and become one itself. Here are the main points of the conversation. Is social equality the answer? When asked about social equality, the author of a manifesto on the new American liberalism affirmed that the equality of result is not what she favors. “Equality of respect and freedom to move and open a business, to enter an occupation, do what you want, and equality before the law, those are enough”, says. For her, the French-style equality, the one from Rousseau, where incomes are equalized incomes afterward is not a good idea, because “people are different and have diverse skills”. In the sense of equality of freedom, McCloskey believes that “the economic function of the government should be minimally to enforce laws of propriety and contract”. For her, there is no need for the State to be a father or a mother, but there are a few things the State should provide, such as small income redistribution for poor people, compulsory elementary school, inoculations against contagious diseases and defense of the country against foreign powers. All that would result in a minimal State interference. Moreover, she affirms that, for the poor, the best thing is a vibrant economy, warning about Brazil. She states that the nation should adopt a more liberal posture, using India as an example. While Brazil grows at 1 to 2% yearly per year per capita growth rate, India is growing 6% or more per year per capita, as well as China. For her, growing at the same pace would solve a lot of social problems in Brazil. McCloskey says that these nations have achieved that because of liberal economy. But, for that, McCloskey says more government supervision is not the solution. It’s kind of like the economic concept of diminishing returns. “A small government with 10 percent of the national income would make sense, maybe 12”, says. Talking about France and its 55% of income that goes the government, the economist claims that this amount of money going to the State is “beyond what is good for us”. Concerning the government investing in companies, she quotes Mariana Mazzucato, a North American economist that talks about the “entrepreneurial State”. McCloskey says that she doesn’t agree with the concept. “Governors are not good entrepreneurs, they make bad choices about things to do. […] the customers and the businesses should decide what to do, not the government”, says. “Free trade is the best thing to do because then you can invest in what you are really good at”, that sums up the line of thought of the economist who believes that protecting domestic industry is “a terrible idea”. She states that there is nothing wrong in being imported-oriented, saying that a nation should buy something from a foreign country if they are good quality instead of trying and producing it itself. According to her beliefs, with the domestic protection, you protect a few thousand at expense of all rest. Latin American countries have felt for a hundred years that things are not going well for them in the world. A lot of the politics in Latn America is about against Europe and the United States. Almost assuming a victim position, and McCloskey says that this has to change. For McCloskey, the wealth of a country is not about exports, national resources, or lands. She says that, in the modern economy, what matters is human capital and innovation. “It’s between your ears that matter, and there’s no reason at all that a free Brazil couldn’t be as rich as the United States”. The economist says that there is still time for Brazil to become as huge as other global powers, such as the US, but, to her, that won’t happen unless the nation changes its economic policies. According to her ideology, there are a few main changes that should be applied, such as selling State enterprises, not applying foreign trade tariffs and dropping labor legislation, except those regarding slavering and sexual assault. She says that a country should develop itself regardless of the government. “I’m not an expert but, so far as I am concerned, I can see a vibrant country, with great art, music, literature, as well as a great industry and great enterprises. I don’t see any cultural obstacles to Brazil becoming rich”. For her, this growth will happen naturally as long as the mentality that the government needs to provide to and develop the population changes. Otherwise, according to the economist, Brazil “will remain comparatively poor”. The story is the same for all Latin American countries, as she believes that all the region’s nations are very creative and have lots of potentials, the real problem being the paternalist/maternalist traditions that are rooted in their history.